Sat., Sept. 30, 2017, 7:48 p.m. 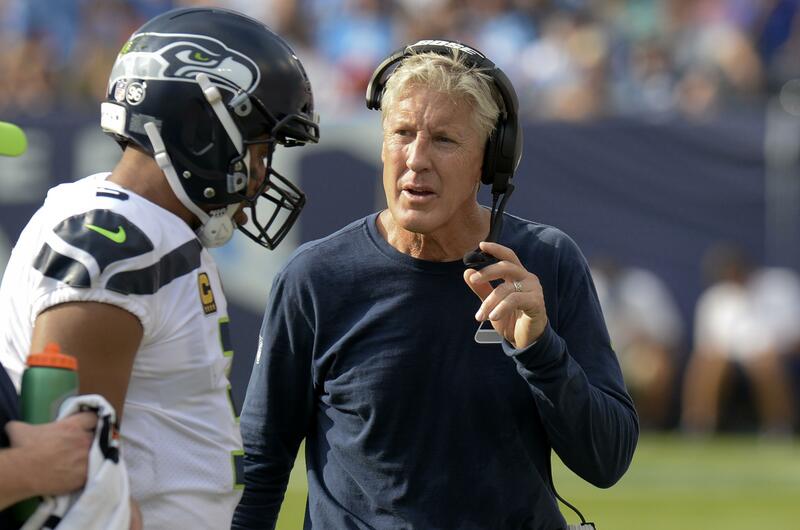 This is Carroll’s eighth season as coach of the Seahawks, and in all but one of those years Seattle has lost at least one of its first two games. The 2017 season marks the second time in three years Seattle has started 1-2. Taking it further, consider that Seattle’s record in September and October under Carroll is 29-26-1. The rest of the season? A robust 42-19. So maybe that history can soothe your soul a little as you assess the team’s struggles out of the gate. It certainly didn’t escape Carroll this week as the team prepared for Sunday night’s game against Indianapolis at CenturyLink Field. A pessimist might note that the team’s best season ever defied the slow-start trend — the Seahawks started 4-0 and 11-1 en route to a Super Bowl title in 2013, looking slightly vulnerable only when losing two of three in one stretch in December. Carroll’s first season also was an outlier as Seattle began 4-2 before cratering to a 7-9 ending. It might feel in hindsight like the Seahawks finished fast that season since they stumbled into a division title and then beat New Orleans in the playoffs. But November and December that year was largely a disaster. Starting in 2011, though, a year that in many ways is the true beginning of the Carroll era with the midseason shift to a Marshawn Lynch-led running game and the emergence of the Legion of Boom secondary, the Seahawks’ seasons have had a pretty familiar template of some early disappointments before righting the ship. Here’s a look at each Seattle season since 2011 and assessing if there is a lesson to be learned to help with a turnaround in 2017. What happened: The Seahawks not only started 0-2 but also 2-6 in Carroll’s second season before winning five of six en route to a 7-9 finish that in retrospect foreshadowed the success to come. What changed: In Carroll-era lore, one of the biggest moments came in a 23-13 loss at Dallas on Nov. 6 when the Seahawks reconfigured the offense around Lynch and the running game. After having topped the 100-yard mark only once in his previous 20 games as a Seahawk, Lynch ran for 100 yards or more in five of the next six games, the Carroll template of a defense and running game finally coming to the fore. The Dallas game came a week after a rookie named Richard Sherman entered the starting lineup for the first time, joining second-year players Earl Thomas and Kam Chancellor as well as Brandon Browner in the starting secondary. What lesson can be learned: Find the next Lynch and turn the offense over to him? Chris Carson, anyone? What happened: Seahawks lost their opener and started 2-2 and 4-4 before winning seven of the last eight. including the final five, to finish 11-5, and then another in the playoffs before losing in the divisional playoffs at Atlanta. What changed: The addition of rookie middle linebacker Bobby Wagner helped solidify the defense as we have come to know it. And another rookie, quarterback Russell Wilson, took over the offense with the Seahawks really hitting their stride late once the team took the reins off Wilson and basically let him do his thing. What lesson can be learned: As was the case in 2012, the real key to the turnaround was exceptionally talented young players quickly maturing and establishing their roles. What happened: Seattle started 4-0 and 11-1 on the way to winning the Super Bowl. What changed: Nothing really. While there might be a perception the offense took some time that season to catch up to the defense, the Seahawks ranked eighth in the NFL in total offense after week three as Seattle was never out of first place in either the division or the conference. What lesson can be learned: This was the most-talented team in Seahawks history. Any comparisons to this squad will always be risky. What happened: Seahawks started 1-1 and 3-3 before winning nine of last 10 en route to a second straight Super Bowl. What changed: What was generally termed a Super Bowl hangover was also largely due to a couple of fluky games and the messy Percy Harvin trade and aftermath. The Harvin distraction helped contribute to two straight losses and reports of the team’s demise. There were also some early defensive injuries that led to some shaky moments on that side of the ball. Once Harvin was gone and everyone got healthy on defense, Seattle rolled. What lesson can be learned: Don’t trade for Harvin? What happened: The Seahawks started 0-2, 2-4 and 4-5 before winning six of the last seven games, earning a wild-card playoff berth at 10-6. What changed: The 0-2 start was heavily influenced by the absence of Kam Chancellor, who ended his holdout heading into week three. Injuries to Lynch, coupled with a re-made offensive line (2014 was the last season for Max Unger and James Carpenter), led to an offensive makeover halfway through the season, with Seattle emphasizing a quick passing game that led to Wilson’s historic run of 24 touchdown passes in the last seven games. What lesson can be learned: Along with 2011 and maybe the unleashing of Wilson in 2012, this was one season when a subtle shift in offensive philosophy provided dividends. Maybe something for Seattle to consider again this year. What happened: Seahawks started 1-1 and then 3-2-1 before finishing 6-3 and earning another division title. What changed: This was almost like three mini-seasons — the ragged start, a 3-0 stretch in November that included a win at New England and had Seattle looking like a Super Bowl contender, and then a 3-3 finish that coincided with the loss of Thomas for the season. So is the past truly prologue? Well, the Seahawks certainly have shown an ability to rally late in seasons, one they might need to call on again. But each season also presented its unique challenge that might make hoping history will repeat itself dicey. That, anyway, was the conclusion of receiver Doug Baldwin, who has been through every slow start and fast finish since 2011. Published: Sept. 30, 2017, 7:48 p.m.